It’s Halloween and time for dressing up, going trick or treating and carving pumpkins. This is also the time of the year for pumpkin pie, pumpkin gingerbread and the PSL (Starbucks’ Pumpkin Spice Latte, for those of you who aren’t familiar with the acronym). Naturally, I too, was inspired to make something pumpkin-y. 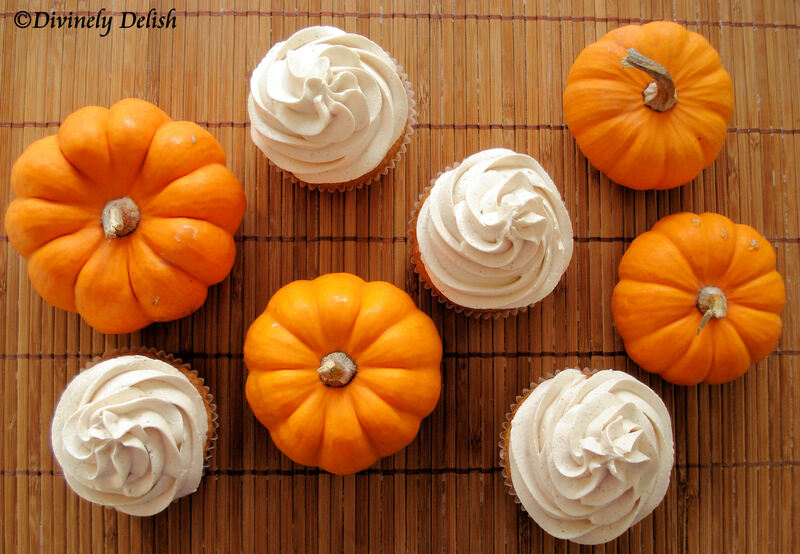 These cupcakes are so moist and flavourful that it’s good even on its own. 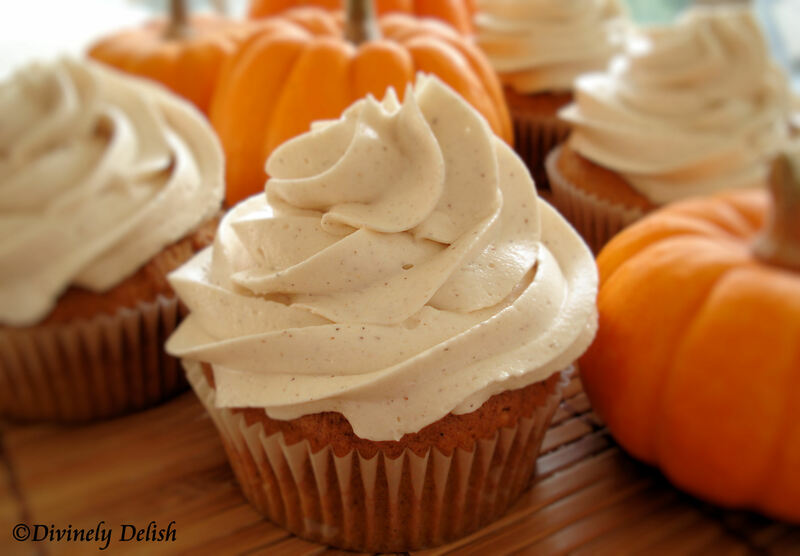 But if you’re in the mood for something sweeter, and don’t want the usual cream cheese frosting, this chai buttercream is a perfect complement to these spiced cupcakes. The combination is not overly sweet, but if you are really wanting even less sweet, I would recommend that you can decrease the amount of icing sugar (confectioners sugar) to 3 cups. 1. Preheat an oven to 375 degrees F (190 degrees C). Grease 24 muffin cups, or line with paper muffin liners. Sift together the flour, cinnamon, nutmeg, ginger, cloves, allspice, salt, baking powder, and baking soda; set aside. 2. Beat 1/2 cup of butter, the white sugar, and brown sugar with an electric mixer in a large bowl until light and fluffy. The mixture should be noticeably lighter in color. Add the eggs one at a time, allowing each egg to blend into the butter mixture before adding the next. Stir in the milk and pumpkin puree after the last egg. Stir in the flour mixture, mixing until just incorporated. Pour the batter into the prepared muffin cups. 3. Bake in the preheated oven until golden and the tops spring back when lightly pressed, about 25 minutes. Cool in the pans for 5 minutes before removing to cool completely on a wire rack. 1. Pour the half and half into a microwave safe mug. Heat for 45 seconds. 2. Remove the mug from the microwave and place the tea bag in the mug to steep. 3. Using an electric hand/stand mixer, cream the butter for one minute on medium speed. 4. Turn the mixer off and add the icing (confectioner’s) sugar, cinnamon, ginger, cardamom, cloves and vanilla extract. 5. Turn the mixer back on at the lowest speed so the sugar does not blow everywhere. Once all the sugar has incorporated into the butter, increase the mixer speed to medium and add the tea-infused half and half. Continue beating until fluffy, about 5-7 minutes. Note: Use immediately or store in a sealed container in the refrigerator for 4-5 days. Alternatively, buttercream can be frozen for up to 3 months. To use, take it out of the freezer and thaw overnight in the refrigerator. Let the buttercream come to room temperature and stir before using.